Earlier in the week, it was reported that Raul Ibanez had signed with the Mariners and that was the last we heard. Nothing was officially announced due to the fact it was the holiday season and a move needed to be made to clear roster space on the 40 man. Now we know the corresponding move and the implications of said move. We also know some people were not too pleased with the signing of Ibanez. We'll get to that, but it'll be short and sweet. D.J. Mitchell was the player DFA'd to make room on the roster for Ibanez. Considering Mitchell is the one to get the axe, its not exactly rocket science. If Mitchell ends up getting claimed by another team, so what? He'll be in his age 26 season in 2013 with pretty much nothing special as far as repertoire is concerned. He's been a starter every season in the minors, getting a little big league time in May and July with the Yankees, accumulating a whole 4 2/3 innings of big league work. I'm not going to go in depth with his numbers due to lack of data, but suffice to say he would not be any kind of a loss to the organization. He probably isn't a starter in the long term and right handed pitchers with a decent change up, curveball and fastball aren't on the endangered species list. What does this mean for Ibanez and the rest of the team? Ibanez was signed more for the presence he brings in the form of veteran leadership. Who knows if it's a definite necessity, but it couldn't hurt and he takes up a spot on the roster previously occupied by a guy who was very much expendable. The Mariners have a very young team with the exception of a couple of guys, so giving the younger players the opportunity to gain tips and information from a guy who's been around for a while makes for sound judgement. At least, I think it does, since I'm kind of just guessing on that one. The one thing that puzzles me about the move is the fact that, earlier in the offseason, the Mariners signed Jason Bay as a platoon/bench outfielder type. Signing Ibanez, you basically have two of the same player in the same role on major league contracts. That doesn't mean they're going to go in to 2013 with their fingers crossed one of them will be productive and that's the end of it. More moves are probably on the horizon (at least, we hope so) and may help make the picture a little clearer. Offensively speaking, Ibanez won't bring very much to the table as a 40 year old DH type player. 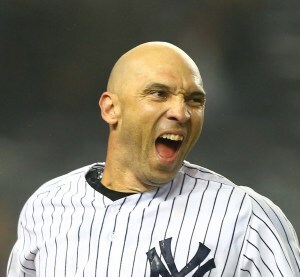 In 2012, he hit .208 with 5 bombs in 216 plate appearances away from the comfy confines of Yankee Stadium, a park with a right field fence a 5 year old lefty could hit the ball over off of a tee. He may not be entirely useless, but his postseason performance in 2012 may have given his stock a slight bump. If you're thinking he may have a little juice left in him, stop. In a game at some point in the season, it's entirely possible, but he's in his 40's and hasn't done much with the bat the last two years. I guess that's not entirely fair since he DID hit 20 homers in 2011 and 19 in 2012, but both of those were in hitter friendly parks and his average in both seasons was under .250. So basically, we have Ibanez is coming back to Seattle for the third time in his career to help the young guys adjust and do his veteran type duties. If you're a Mariners fan who is a bit miffed or are up in arms about this particular signing, I urge you to take a step back and let the offseason play out. There's still a ways to go and other free agents out there that Seattle could sign if they find the right one. I'm sure the Yankees didn't think Ibanez would be the one to keep them alive in the postseason in 2012, but he did. Sometimes, the minor deals can surprise you and other times they turn out just the way you expect them to. Look at this signing for what it is and nothing more: A team of younger ballplayers trying to adjust to the big leagues getting some assistance from a guy who's been around long enough to know when and how to give those guys a helping hand. If Ibanez turns out to be productive, consider it a bonus on top of what his actual job in the coming season will be.